Floating down the Deschutes isn’t just the average Bendite’s favorite summer pastime, it’s also a part of the city’s history. Starting in the 1930s, Bend held a nearly annual Water Pageant, complete with floats (the kind that actually, you know, float), queens and kings, and soapbox derbies. And while that once-popular summer event petered out by the 1960s, a fondness lingers. 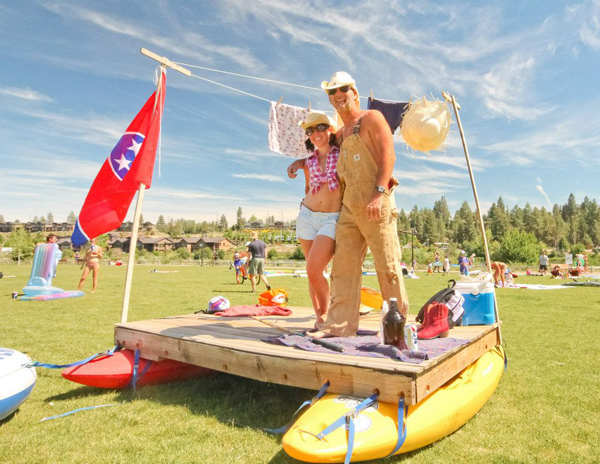 The (Subaru of Bend) Outside Games is drawing on that nostalgia for its third annual float event, now called the (Pepsi) Freedom Float. As the name suggests, the event also takes a page from the Bend’s popular Freedom Ride—and, like sporting events and coliseums around the country, adds a layer of corporate sponsorship. This year, Platt says, the goal was to make the event as accessible, and enjoyable, as possible. Though organizers had considered branding the float as a rebirth of the historic Water Pageant, they ultimately decided that was too involved. Traditionally, the pageant included the election of local queens and kings—similar, in many respects, to the Rose Court associated with Portland’s Rose Parade—and a heavy focus on attracting local businesses to sponsor elaborate floats. “The Outside Games are trying to incorporate all the cool activities we have at our disposal here in Bend,” Platt says.